What a smashing day on all counts! 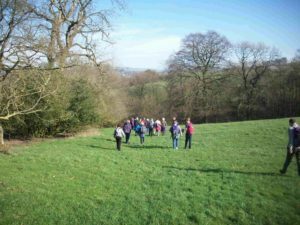 A good turn out and convivial company, one of the best February days ever and a most interesting walk. 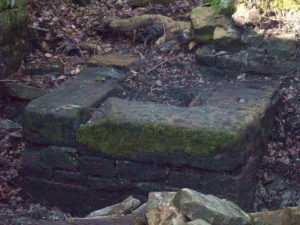 A most interesting feature was the forge in what would have been the ruins of the smithy. 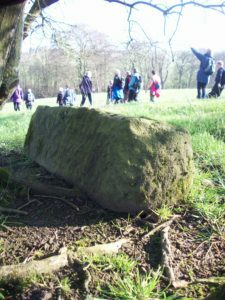 A huge and solid oblong shape with the marks of the smith scored on the stone and the centre filled with ash. This outing provided us with a flavor of what life would have been like for the locals in past centuries, although the mine is very sheltered and indeed very hard to find without a guide, the workers would have been very exposed to the elements as they walked across the fields to work. Along our journey we spied the diamond shaped scorings on gate stones guiding the people who could not read to work. We saw and heard the first curlews and lapwings and saw our first Peacock Butterfly! And what could be better than ending the day be a visit to the Admiral Lord Rodney! 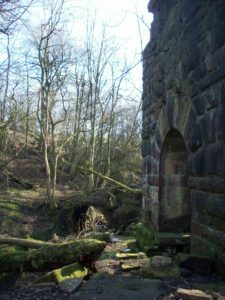 Copyright © 2019 Friends of Pendle Heritage. All rights reserved.